Slots.lv was founded back in 2013, so while they are not the newest casino that exists, they are still widely considered to be a relative newcomer. The site is owned and operated by Lynton Limited and makes it known that they are unlike a lot of other casinos in that they have a 3rd-party company perform an audit every year. The audit is to ensure that the games are indeed as random as Slots.lv claims they are. Despite its name, Slots.lv offers much more than slot games alone. In fact, at any given time there is in upwards of 200 games on the site. Granted, more than 100 of those games are slots, but just about every type of casino game you can imagine is available here. Something else worth noting is that the site itself features a nice, soft white theme and is organized in such a way that finding any game at all is not difficult or confusing. This is great and really amplifies the overall casino experience. With a $22 free chip bonus waiting for you just for signing up, along with an a great interface and support, Slots.lv is one of the premier online gaming destinations out there today. Check out the rest of the review for more information. Enjoy! On your first deposit, you will be given a 200% match with up to $1,000 in bonus monies available for you. Then, on each of your next 8 deposits you will receive a 100% matching bonus up to $500. This means that if you deposit $100 each time, your first deposit will see you have $300 with which to play and your next 8 $100 deposits will actually give you $200 with which to play each time. It is truly a great bonus for new players and encourages you to come back again and again. Though this is something that was always going to happen when you consider the overall offering of Slots.lv. As far as wagering requirements are concerned, the playthrough requirement is 35x. Other terms and conditions apply, but these are spelled out on the site. There are a multitude of bonus opportunities at Slots.lv – you just have to find one that caters best to you. Or you can test the site out yourself for play money. However, there is a better solution. Slots.lv will actually GIVE you $22 FREE just for opening an account and trying out the best in real money casino games. Simply use bonus code “SLOTS22“ to activate your free bonus cash! Check out the promo below or read on for more about their amazing Slots Rewards program currently offers to all its players. My Slots Rewards may sound like nothing you have ever heard of before, but the fact of the matter is that it is a concept that is familiar to many. For lack of a better way of describing it, this reward structure is similar to the VIP programs you will find on many other sites. There are different My Slots Rewards levels, each of which carries with it its own perks, bonuses, and other rewards. Reward points are accrued by simply playing the real money casino games you would be playing anyway, so earning them takes no extra effort on your part. As you may or may not know, the software utilized at a site is crucial because the quality of the software determines the quality of a player’s overall experience. At Slots.lv, there is nothing to worry about as some of the biggest names in the online casino software industry are utilized. Among the software providers utilized, Betsoft and Rival Gaming are chief. These two companies have been around for quite some time and have been regarded time and time again as playing host to some of the best casino games around. Whether you choose to download the casino software client or play within your web browser, the functionality of the games never has been an issue and we do not envision that changing anytime soon. From the classics to new-age games, these two providers alone are able to offer a uniquely subversive player experience. 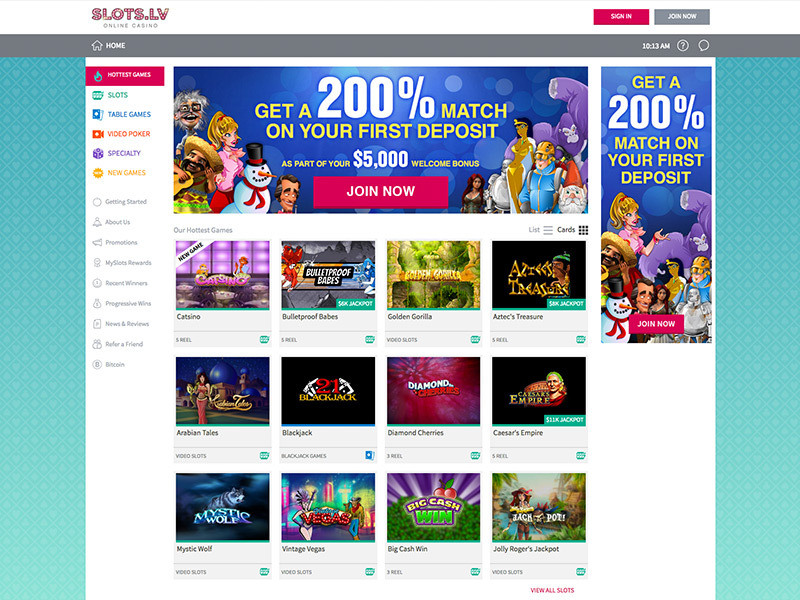 Slots.LV Homepage – Easy to use game selection and tabs. At any moment in time you will find in upwards of 200 games offered by Slots.lv. While there is a healthy, healthy offering of slots, other casino games are not neglected. A simple drop-down menu located at the top of the homepage will bring you to the different categories of games offered, which include slots, table games, video poker, specialty games, and new games—which features the most recently added games on the site. As far as table games are concerned, you will find familiar games like blackjack, craps, and baccarat, to name a few. Slots, however, is where this site really shines as they cover just about every category of slot games available. If you are into classic, reeled slots, Slots.lv has them. If it is video and 3D slots you are looking for, they have those too. Judging from the name of this casino, if you have come to play slot games you will be far from disappointed; that much we can say with certainty. Because Slots.lv is available to residents of the United States, the banking options are not quite as expansive as many players might hope for. When it comes to making deposits, your only two options are Bitcoin and credit/debit cards. If you do use credit cards, these methods carry with them a small fee amount that is added to the total deposit once it’s cleared. Bitcoin carries ZERO fees and this is why it’s one of the more popular methods on the site. When it comes to withdrawals, you are eligible for one free cash out per month. Unfortunately, the only cashout options available to you is a mailed check. Though this may sound inconvenient, Slots is very quick about processing and dispatching all cash outs. Once again, though, if you use Bitcoin to facilitate your withdrawal you should expect your money same day and that carries absolutely NO FEES at all. Is Slots.lv FULLY Mobile for iOS and Android? The way Slots.lv is setup makes playing real money casino games via a mobile device a possibility. So long as you have internet connectivity, just about any game that can be played on the desktop version of the site is also able to be played on a mobile device. It doesn’t matter whether you have an Android, Apple, or Windows phone, the fact of the matter is that real money casino games are available to you. What’s more, the functionality of these games is without a glitch of problem. Between the simple organizational style of the site and the sheer quantity and quality of the games on offer, we have very few complaints with regard to Slots.lv’s overall offering. Though the number of banking options leaves a lot to be desired, Slots does not have many options seeing as sites that cater to US audiences are limited with regard to what they can offer. The fact of the matter is that Slots.lv offers a quality real money gaming experience that you will seldom find at any other casino. The future looks bright for this young site that seems to be constantly improving its offering and upping its game. 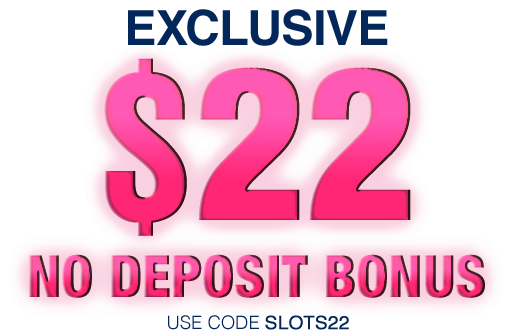 Get your $22 FREE bonus chip at Slots.lv today!